Halibut and chips at Go Fish, $12.50. I hate my birthday, so every year I try to escape to another country to avoid it. This year, traveling solo, I figured I should go somewhere easy, so my friend Jessie Cayabo — who does PR for various restaurants in Calgary — seemed like the perfect person to visit. She suggested I land in Vancouver before hopping over, and that was an ideal plan. I hadn't been to Canada since I was nine, so I was way overdue for a visit. Vancouver has become a super foodie town, and stopping there for two days was a great way to get some touristy stuff out of the way so I can go back and simply eat my way through. It was also a great opportunity to hang out with Christine Campbell, a.k.a. @GreatNorthernPineapple, on her home turf. As soon as I landed, Christine whisked me off to Kitsilano Beach to check out the art and scenery, then the Granville Island Public Market. If you're a foodie, this market is definitely a must-see. 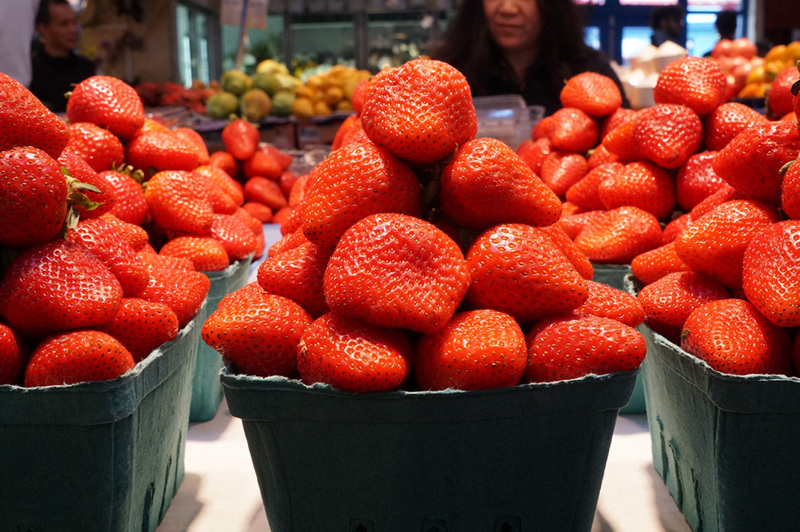 The produce is big, bright and beautiful, piled high in a show of abundance. Chili flaked maple salmon nuggets?! This stuff is sweet, salty, and spicy, amazing as is or on a bagel. I told Christine this was like Canadian poke. The Oyama Sausage Co. is a popular meatery for restaurants as well as home cooks. Remember this name for the next blog post. Not only do they have ravioli with unusual fillings, they have rare mushrooms, stuffed bagels, fancy chocolates and more. I wish I had enough space to show you more photos! I guess you'll have to see it yourself. Nearby, also on Granville Island, you'll find a popular eatery called Go Fish. They're known for serving up seasonal, sustainable seafood (mostly fish and chips), and people go for the view since it's right on the water. I got the halibut (top photo), since the season was about to end and it was highly recommended by the staff. Here's the cod with chips ($9). Christine got a Po'Boy ($10.50), which she said was good. You can't argue with the quirkiness or ambience of this place, especially in nice weather. The food is served piping hot, which somehow tastes extra good when it's cold outside (which is most of the time). After a day of sightseeing, we wandered around downtown Vancouver and ended up at Cactus Club Cafe on Coal Harbour. Now, many foodies have said that it's a chain, but who cares? This place has a great view of the water and of the Olympic flame. As luck would have it, there was a special convention in town and they lit the flame when we got there, which the city rarely does. David and Christine Campbell goofing around with our cocktails at Cactus, which I highly recommend. Their drinks are really nice! We had a lot of food, and you can see the rest of it on my Flickr, but I recommend the butternut squash and mascarpone ravioli ($28) topped with truffle butter, sautéed jumbo prawns, pine nuts, and crispy sage. This kind of stuff is always better on the mainland! To see the rest of my photos from this trip, click here. Up next: Meeting a local Vancouver chef before heading to Calgary!